I’m always getting moaned at by my wife and Daughter to “have a shave” ” every time you kiss me you cause a rash with your stuble” in a nut shell I hate Shaving, its such a parlava. I would much rather pay to have a cut throat razor at my Barber than dangle over the bathroom sink and shave myself. If you look at the Razor Blade aisle of your supermarket, you will see a big variety of Disposable Razor Blades, some with the single blade. Some with 2,3,4 or even 5 blades. But what’s the difference? Even blades come with a moisturing lubricantion strip? What’s that when it’s at home ? Recently I was asked to review the new Hydro 5 razor from Wilkinson Sword as a suggestion for a Fathers Day Gift. In the past I’ve been given vouchers for a cut throat razor shave which is amazing, but I was sent The Hydro 5 to try. Wilkinson Sword are of course a well-known Brand for quality and for their innovative shaving products which offer value for money. A household name that most Men love and trust. I really liked the design and colour of the Handle blade a cool blue and white pattern. It also features a new ergonomic handle. This has been designed to fit perfectly in your hand and give a full range of motion. 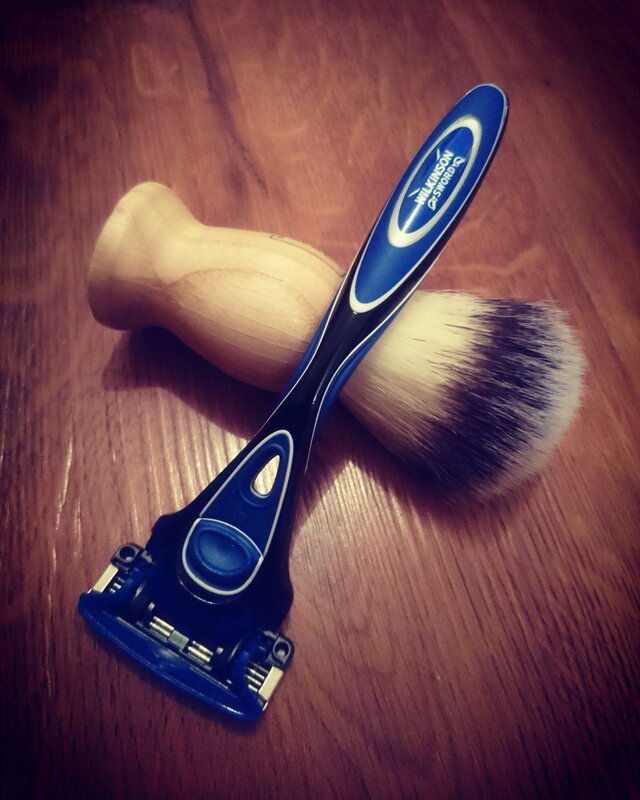 The handle itself doesn’t feel too heavy nor does it feel to light and “cheap” it has just the right amount of weight to feel comfortable whilst Shaving. For the difficult to reach contours of your face you can activate the ‘flip trimmer’ with a quick flick of your thumb. This pushes the hydrating gel pools to the back and enables you to benefit from unparalleled control and precision.I thought that this was just a gimmick but it actually helped to shave around my ears, above my lip and around my nostrils. The guard bars and reduced blade span have been redesigned on this model too to improve comfort, safety and prevent your skin pinching. This all helps to avoid those annoying little nicks. Before my 1st shave I was rather sceptical about the razor. “Oh another razor blade with 1 more Blade than the last version” was my 1st thought. I was proved wrong with my 1st shave, as it was super sharp I didn’t have to have a 2nd clean up shave as the blades are super sharp. Having used disposable razors in the past and knowing how costly they can be and also how quickly they get blunt I was dubious of another “Manly razor blade” but I have to say I was wrong. I really like these Blades. I used them for a number of shaves now and they still feel razor sharp like the 1st shave I had with them. I will definitely be using these blades again for future shaves. This post was written in collaboration with Wilkinson Sword however all opinions and words are our own.